The ongoing Comedy Countdown at Wonders in the Dark is in full swing, and my second contribution to the event is now up on the site! 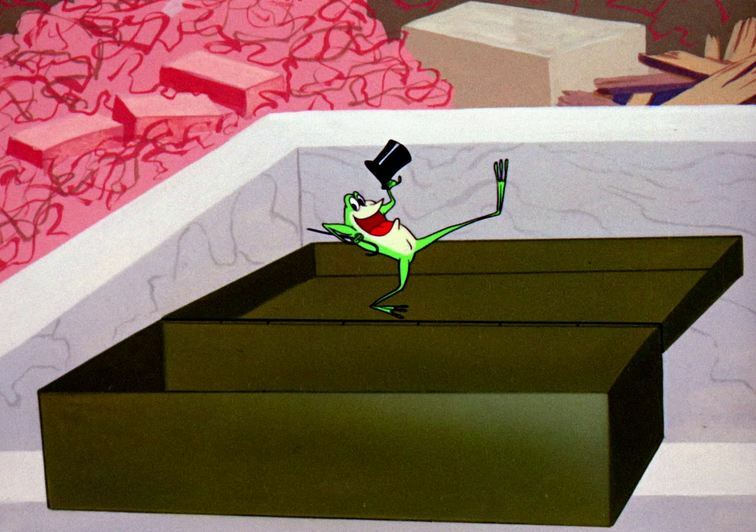 By sheer coincidence, number 69 on the countdown is the 1955 animated short One Froggy Evening, directed by none other than the subject of our week-long animation celebration, Chuck Jones! Head on over to Wonders in the Dark to check out my thoughts on this classic cartoon! The comments section over there can get quite animated (see what I did there? ), so please feel free to add your two cents to the conversation! September 18, 2012 in animated shorts, animation, announcements, blogathon, brandie's faves, classic cartoons, contributed post, hahas, kiddie faves, pioneers of animation. Tags: chuck jones, warner bros.
I’m headed over to see it, Brandie. I’m just WILD about this cartoon…LOL! Yay! This is one of my all-time faves! I’m a sucker for all things Looney Tunes and Merrie Melodies and worship the extraordinary talents behind all of it. But can I say that this particular cartoons gives me the creeps. It used to scare me senseless as a kid. The frog dancing and singing. Dunno why.